I’m about three thousand words away from finishing the final draft of A Supervillain in King Arthur’s Court (SKA for short.) It’s taken way longer than it had any right to, but at long last there is a light at the end of the tunnel. I’ve actually had the cover of this book sitting in my inbox since April, which was the last time I thought it was almost finished. I think I”m close enough this time to drag it out and reward everyone for their infinite patience. You can also go ahead and add it to your shelves on Goodreads. Of course, there’s still all the editing and typo checking and whatnot to come, but hopefully before the end of the year it will be done. Yay! If anyone is interested in ARCs in exchange for reviews and helping promote, please let me know and I’ll be happy to oblige! 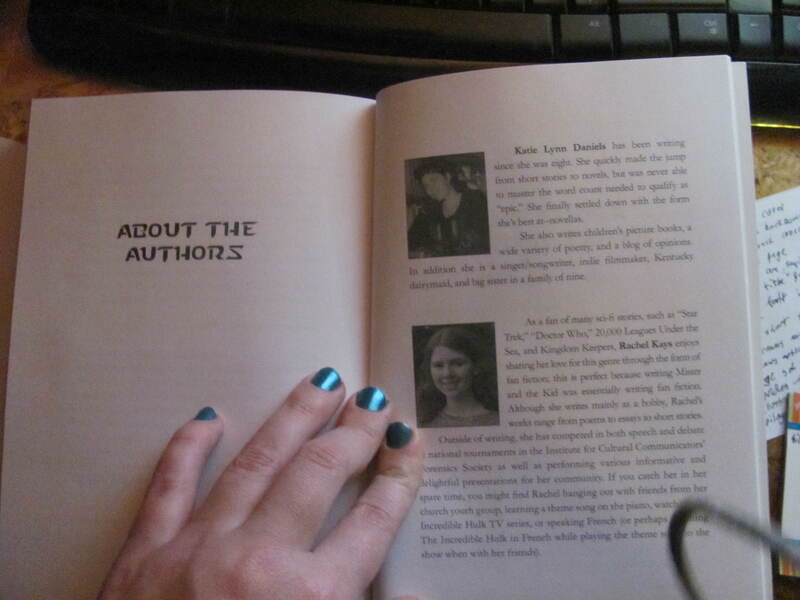 Also, this book features a commercial break. (Don’t ask–it’s a surprise!) I want it to be drawn in the style of a 40s magazine advert. If anyone here has drawing skills, or know someone who might be able to do so, please let me know and I’m sure we can work something out. Without further ado, the cover! Many thanks to BushMaid for her awesome work on this! It’s been a while since we’ve ran a sale, and this one is going to be amazing! 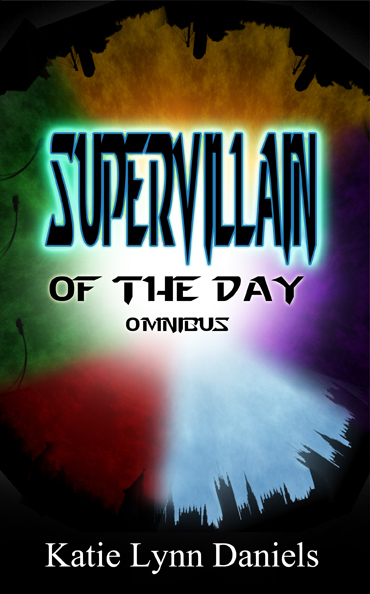 Supervillain of the Day is featured this week on Homeschooled Authors as part of their annual Read-to-Win Program. The way it works is like this. You buy a book for $0.99. You read the book. You review the book on Amazon. You enter your review for a chance to win a $100 gift card. Pretty straightforward, right? Well, it gets even better. I have an entire series, and the first book in that series is $0.99 pretty much all the time. So I thought, instead of picking just one book to put on sale, why not put the entire series on sale? That way you can jump in and play no matter where you’re at. Are you all caught up except for the newest release? Get it now! Are you just starting out? It’s our lucky day! Did you get stuck halfway through because your don’t have a lot of book money? Get four novellas for the price of one! The sale starts today (July 6tj) and ends next week on July 12th. There are eight novellas and three short stories all available for only $0.99 each. And just to make it even more attractive, I’ve lowered the price of the omnibus to $4.99 as well. 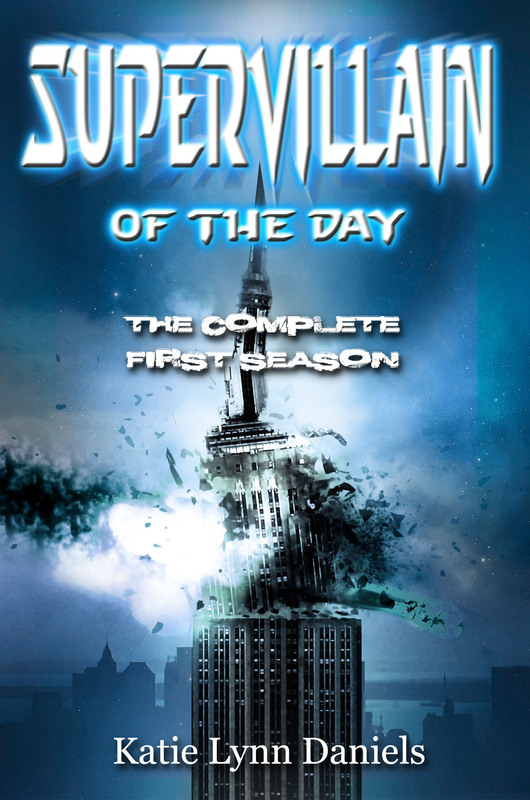 If you haven’t read the entire first season yet, the Omnibus is a must-get. 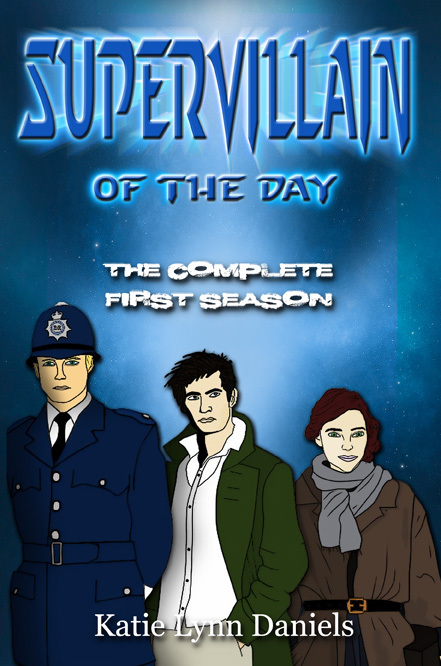 It comes with the bonus stories, and includes the new and improved editions of the novellas. As you may have noticed, this website has been pretty dead for the last year or so. We blame this entirely on supervillains. After a long and difficult battle, we have finally regained the upper hand, and are proud to present a newly revamped and even shinier website! So what have you missed? When you last heard from us Superhero of the Day had just been released. Since then The Dragon of London has been added to the line-up. Both are available from Amazon. You may have heard of Mister and the Kid–the exclusive short story we published with the omnibus. It is now available as a standalone story on Amazon. There is also another new short story, this one published between 2.1 and 2.2. So You Wanna Be A Hero is a second-person short story that deals with some of the aftermath of the Season 1 finale. 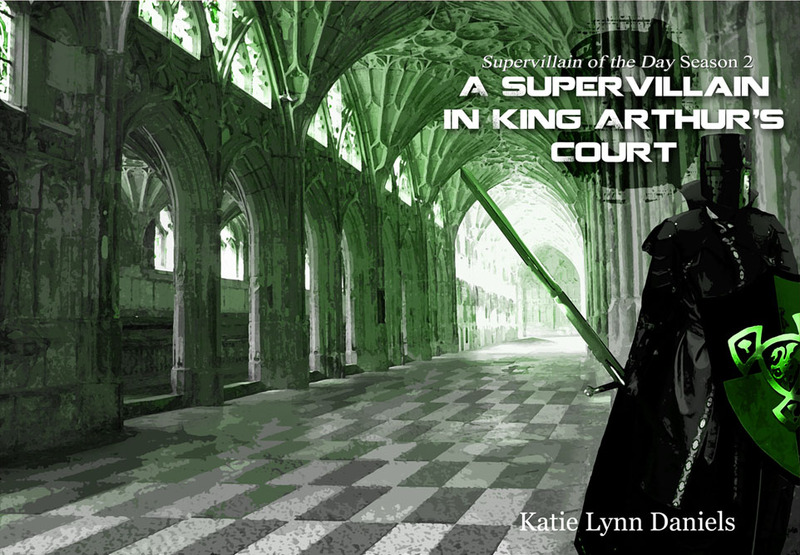 Sometime this summer “A Supervillain in King Arthur’s Court” is going to be released. The cover is already done, and waiting for a grand reveal. This season is taking much longer to write then the last one, but rest assured, progress is occurring. There may also be sneak peeks in your future. So excited to be back online! Be sure to subscribe for future updates! And if there’s something you’d like to see added to the site, feel free to comment! Season Two has officially begun! 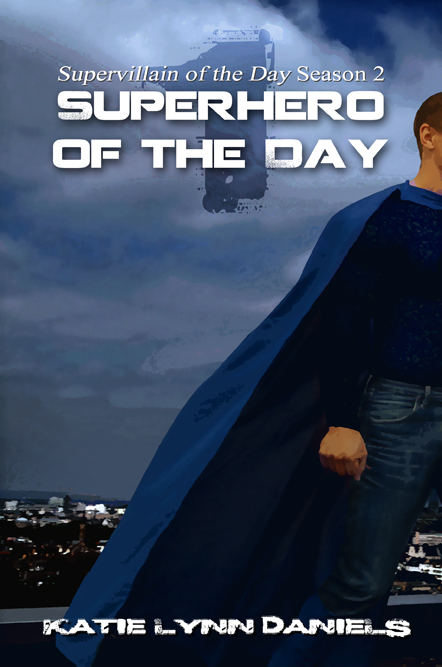 Get your paws on the first book of the year and buy “Superhero of the Day” from Amazon! Available as a paperback and an ebook! Wait, I hear you say. Aren’t you forgetting something? What about preorders? What about signed copies? Dearhearts, if I have to ship another package to anyone this month I’m going to have a nervous breakdown. If you really, really, really want a signed copy you can do one of three things. 1. Meet me in person and get me to sign your book. That’s right, I’m giving away signed paperback copies of the first two season 2 books to some lucky reviewer of the omnibus! See the details here. For everyone who funded the kickstarter and is still waiting for their copy–patience. I blame the government, and supervillains. Your books will be there soon, I promise. And when they arrive, it will be worth the wait. So what are you standing around here for? Go forth and read! To make things even better, the kindle version is enrolled in the Matchbook program for free. 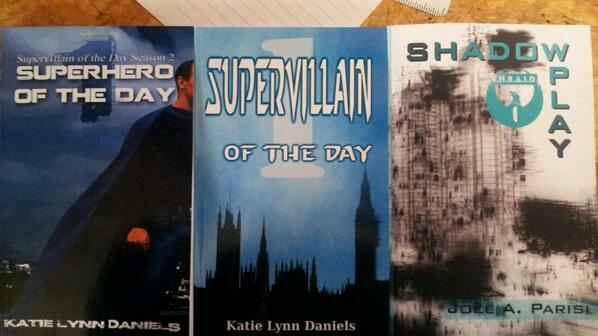 So if you buy the paperback you get the ebook copy as a bonus. So if you’re like me and you want to own hard copies of books but read them all on your Kindle, you can do that! It’s awesome! And did we mention illustrations? Last, but not least, please leave me reviews. Reviews are extremely important when trying to sell a book because they increase your visibility. I never used to understand reviews, because I certainly don’t read them, but it’s not about reading them. (Although believe me, this author hangs on every word a reviewer writes.) It isn’t about the words you write in the review–it’s about the accumulation of ratings over time. Writing a review is proof that you read the book, whether or not you enjoyed it. The more people who read the book, and rank and review it, the more statistics Amazon has to process to tell others whether or not they’ll like the book, and the more visible the book becomes. The more reviews the better, so get hopping! If anyone wants a free ebook copy for review purposes–I can make that happen. So what’s next? I’m glad you asked that! Joel A Parisi released the first novelette in his series just last week: so if you haven’t read that, go check it out! And leave him a review as well! Reviews make us feel loved! 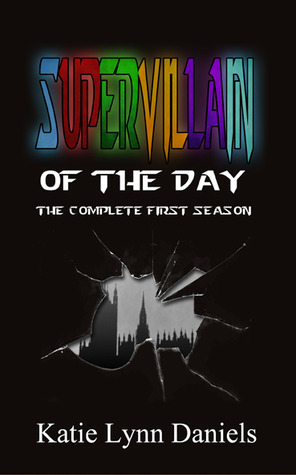 And next week I’ll be announcing the release of “Superhero of the Day”, the first book in the second season of “Supervillain of the Day.” Exciting, yes? The proof copy for that is in the mail, so keep your eyes peeled on Facebook and twitter for the official announcement! Excited? Good. We’re almost done. 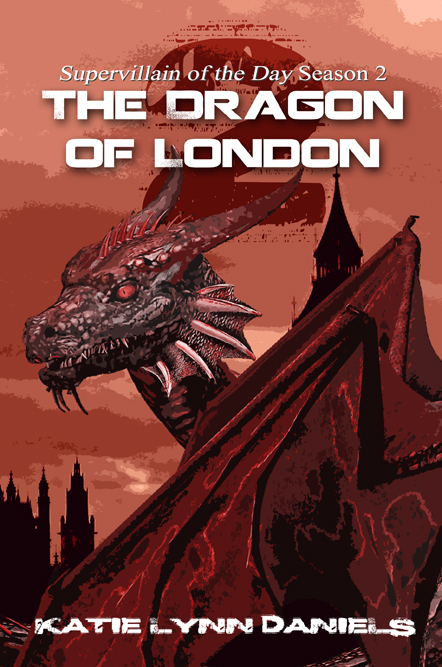 Day” AND one of “The Dragon of London” to one randomly drawn reviewer of the omnibus! That’s both spring releases in one fell swoop! In order the qualify the review must be posted on the Amazon page, although posting it on your personal blog or social media site is also welcome. 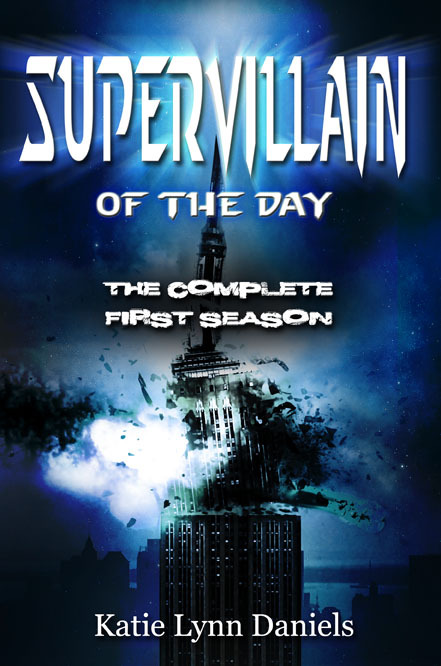 In order to enter send an email to supervillainoftheday@gmail.com with the subject “Review Contest” and include your shipping address, and a link to your review on Amazon. The drawing will be held on April 30th, and prizes will be shipping sometime after “The Dragon of London” comes out, sometime in mid-May. So get busy! Write those reviews! Share with family and friends! Enjoy the pretty drawings! And get ready for the new season–because it will blow your mind! It’s in, finally! You know what that means? Just a few more weeks until it goes to print! The process of making the cover for the omnibus was…very interesting. We went through many different designs before settling on one we liked. Looking back on this particular adventure I thought perhaps you would like to see some of the designs that were rejected. They range from bizarre to ethereal and while they’re all quite good they need a different novel in order to be truly appreciated. To BushMaid’s credit this is almost exactly what I asked for at the time. But then it just….wasn’t quite right. Remember this one, though. We’ll come back to it. Which appalled the artist despite not being familiar with that poster. I almost went with this. But everyone kept saying: “It looks like a graphic novel.” I kept saying: “Is that a bad thing?” and eventually decided it wasn’t what I wanted. So what did I want? First of all, I really love this. Second of all, it’s a bit nebulous….so BushMaid said wait, I’m not done, let’s make it more dramatic! And at this point I couldn’t even remember what I liked or what I wanted or anything. I went back to the earliest design (remember I told you it would be important?) and I said….I still like this one. It’s just…there’s something missing. But I like it. I like the simplicity, and I like the color black. So I said…back to the drawing board. I said, what if the focus was the title, the cover was black, and you did something with broken glass to imply violence? 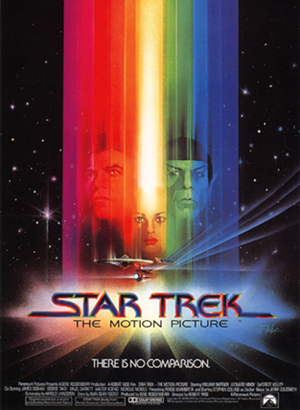 This is essentially the same cover that will appear on the final book. We made a few tweaks, but nothing significant. It turned out beautifully on the first try and I looked at it and said: aha, yes, this is the one. I can feel it in my bones. 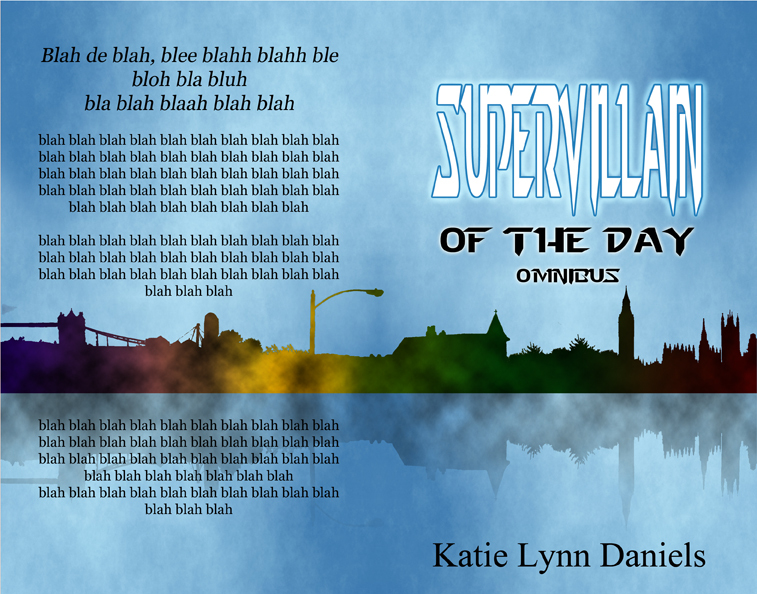 And that, my friends, is how you design an omnibus cover. 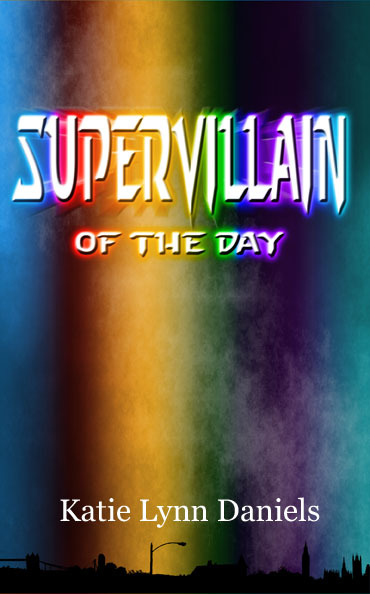 A little over a year ago I released my first novella Supervillain of the Day under a creative commons share-alike license. I talked about what that is and what it means. I tried to get the attention of Lew Rockwell and other free information people, to no effect. Most of my fellow authors were like: that’s cool, but why would I do it? I’ll tell you why. I am incredibly proud to present Joel A. Parisi’s new series SHRAID. I am very excited about this series for two reasons. 2. It’s released under a Creative Commons license. But the most exciting thing about it, to me, is the license. In order to write a spin off to my series Joel needed to abide by the terms of the license, specifically the “share-alike” part. Which means now you’re free to write a spin off to his series. Which means I can hijack his characters if I so choose, without permission! (Although if I want him to keep speaking to me, I’ll ask permission.) Isn’t Creative Commons wonderful? And for you SotD fans out there, it gets even better. SHRAID is going to be considered official canon for the SotD universe. Joel asked if I would endorse it, I said yes. There’s even rumours of a crossover next year. Enough about me! Go read his (beautifully designed) website and like the Facebook page for further updates! If you like our Facebook page you’ve already seen this, but in case you haven’t, here it is! Cover reveal for the first book of the second season. The adventure continues! Are you ready?